A horse ferry had linked the Lambeth and Westminster banks of the Thames for centuries, one of only a few Thames ferries capable of taking a coach and horses. The ferry sank on many occasions, notably in 1633 with Archbishop Laud’s belongings and in 1656 with Oliver Cromwell’s coach. Permission to build a bridge here was first sought from Parliament in 1664 but was refused because of strong opposition from the Company of Watermen. Mary of Modena used the ferry when escaping to France with the baby Prince James in 1688. 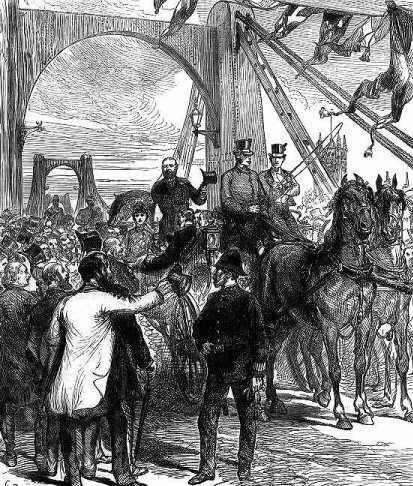 The building of Westminster Bridge in 1750 caused the ferry to close. 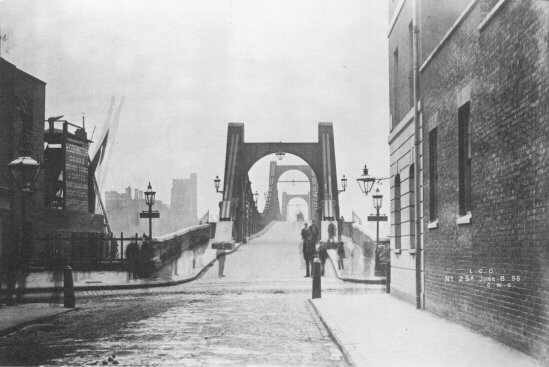 The first Lambeth Bridge was built in 1862 as a toll bridge. It was of a suspension type, strengthened by a lattice structure, and designed by Peter William Barlow. There were three spans each of 268 feet. It became toll free in 1877. The present five-span steel-arch bridge was built in 1929-32 to a design by Sir George Humphreys with Sir Reginald Blomfield acting as architectural consultant. It was fabricated by Dorman Long, Middlesbrough and is 776 feet long and weighs 4,620 tons.